You know a damaged roof can spring a leak, soak the attic and ceilings and cause extensive property damage. However, you may not realize there’s another potential problem on top of your home. Did you know that masonry chimneys can develop serious water leaks? These stone or brick structures stand up to the elements all year-round. When age or damage opens them up to rain and humidity, you’re facing all types of chimney water damage. Chimney water damage usually takes homeowners by surprise. It makes more sense to blame the problem on a leaky roof. You just don’t think about water coming into the house from around a chimney’s structure or through its materials. Knowing why it happens and what to look for can give you a better chance to minimize the damage. 1. What Causes Chimney Leaks? Spring storms, lightning strikes, high winds and winter blizzards all take a toll. Age factors in too. Materials break down, and water gets into the house. These are the most common components that can cause a chimney to leak when it rains. Chimney Cap – A damaged or missing chimney cap can’t keep out rain, sleet and snow. Cement Crown – Cracks in the chimney crown allow water to leak into the flue lining. Chimney Bricks – Seasonal freezes and thaws eventually degrade porous bricks and result in slow seepage. Chimney Mortar Joints – Older mortar joints deteriorate and allow moisture to leak into the structure. Metal Flashing – Damaged chimney flashing can’t hold a waterproof seal between the chimney and roof. 2. What Are the Signs of Water Damage From a Chimney? A chimney system is built to breathe. When it works as designed, it funnels smoke and gases up the flue. When water damage compromises the system, problems develop from the exterior stack to your home’s interior walls. • Water damage often shows up as algae on chimney stack bricks and exterior walls. • Thin tile shards from the flue liner begin to drop into the firebox. • Look out for a rusting damper, fireplace doors, frames or accessories. • A water-damaged chimney mantel might look stained or warped. • Water damage appears on inside walls not far from the brick chimney. • Warped baseboards and flooring next to the fireplace are signs of chimney water damage. • Stains or bulges in the ceiling adjacent to the fireplace are cause for serious concern. 3. Is Chimney Water Damage Covered Under Homeowners Insurance? Most homeowners insurance policies cover unexpected events like water damage after a house fire or flooding caused by frozen burst pipes. In the case of a chimney leak, an adjuster inspects problem areas and looks for any signs of poor maintenance or routine wear and tear. If the water leak from your chimney resulted from an unforeseen mishap, you should be covered. In cases of chimney damage from lightening strikes, high winds or severe storms, most insurance carriers will pay the claim. Check your policy, and discuss the details with your agent. 4. What Is the Average Cost to Fix Water Damage Around a Chimney? The cost of fixing a chimney leak averages between $150 and $350 but can run higher if the system is badly damaged. The national average for a big job runs a little over $450. Taking care of interior water damage is a separate expense. It also depends on the extent and location of damage. In addition to cleanup and restoration, you may need structural repairs. Mold removal and remediation are often an important part of the process. 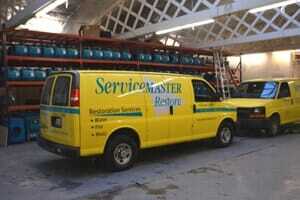 A reputable restoration contractor will give you an accurate quote after an inspection. Be cautious about hiring a company that gives water damage estimates over the phone. We don’t fix crowns, flues and flashing, but we do take care of all types of chimney water damage repair. From soaked attics and ceilings to stained walls, wet carpets and damp floors, our teams handle everything. We even help with your homeowners insurance claim. If you’re not sure about the source of a water leak in your home and you’re in the Chicagoland area, call us right away. We’ll find the problem through our comprehensive water damage assessment. Whether it’s in the ceiling or down in the basement, you can always count on ServiceMaster by Zaba to take care of water damage in your home.